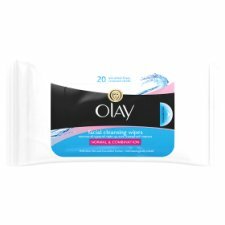 Olay Facial Cleansing Wipes leave your skin like it never had make-up on. Each of these special pre-moistened cloths is covered in soft cleansing pockets to lift away dirt and make-up – even waterproof mascara. With light Olay moisture they leave skin feeling clean, soft and smooth all in one easy step. They come is in a resealable bag - easy to store and convenient to use. No water needed. Olay is about beauty, inside and out. Try these ready-to-use cleansing wipes, for a fresh start to your skin care routine.